Such pressures surely weighed down on the State Department this time as well. But there’s one major difference: Whereas the Obama administration’s hold on weapons systems had not produced changes in Egyptian policy, the Trump administration’s pressure appears to be working.Whereas the Obama administration’s hold on weapons systems had not produced changes in Egyptian policy, the Trump administration’s pressure appears to be working. After stalling for five years, in April, Egypt’s highest appeals court finally ordered a retrial in the 2013 NGO case. Meanwhile, the government has demurred on implementing some provisions of the 2017 law regulating NGOs in Egypt, such as the imposition of a tax on foreign grants. 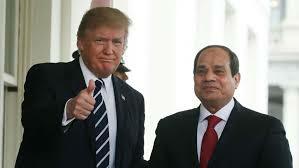 Administration officials likewise assure me that Egypt has forced North Korea to reduce the size of its embassy in Cairo (which was previously the country’s largest in the Middle East) and has apparently halted military transactions with Kim Jong Un’s government. This is a dangerous time for the United States to lose all influence in Egypt.This is a dangerous time for the United States to lose all influence in Egypt. For the 11 months that U.S. military aid was on hold, Egypt’s political situation deteriorated markedly. In March, Sisi staged a farcical election in which every credible challenger was arrested or intimidated out of the race. Over the last few months, Sisi has continued locking up activists, Islamist and secular, but has started to target bloggers and other political commentators as well. Terrorist groups, including the Islamic State, have already exploited unprecedented repression to ramp up their recruiting efforts in Egyptian prisons, which were the breeding ground for many al Qaeda members a generation ago. Sisi’s polices could even lead to the very type of instability that has swelled refugee flows elsewhere in the Middle East and Africa. Although withholding aid will not turn Egypt around overnight, sustained pressure could serve to protect and ultimately expand the space for Egyptian civil society, the health of which is crucial for resilience in the face of security and economic challenges.